Fantastic Location, Steps from the River and Miller's Landing Park and Pet Friendly! 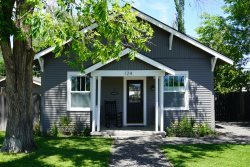 The River Gem Bungalow is a bright and cheerful one bedroom treasure nestled in the heart of Bend's popular Westside with a location that can't be beat! Right across the street from the Deschutes River, it is within walking distance of the Old Mill District, historic downtown, Les Schwab Amphitheater, and numerous breweries. Directly behind the house is Bend's newest park, Miller's Landing: a riparian strip of riverfront with nesting osprey, walking trails, and excellent river access. Only a few steps away is a charming footbridge that takes you over the river on an easy walk to Columbia Park and "Pirate Playground", a wonderland for kids. This natural-contemporary style home features high ceilings, lots of windows, a cozy loft and artistic touches that highlight the authentic Bend lifestyle. Relax on the deck or under the aspens in the big backyard, surrounded by mature trees and landscaping. Second time here at this duplex/location, and will always be my choice for Bend. Location is the best part about this place. We did not drive anywhere, we just simply walked or rode bikes to any location we wanted. Very convenient for our dogs with the fenced yard and located right next to Miller Park and the river. The unit was very spacious with every convenience needed. This location is highly recommended. The location was great for experiencing everything Bend has to offer. You are walking distance from the bars, restaurants, etc. The entire place was clean and comfortable. All the amenities we needed are there. The check in process was extremely easy. Highly recommended! Perfect location for walking and great fenced in yard for the dog. Bed was super comfortable and the place was extremely clean. I would stay here again for sure! Everyone from the Management to the Ownership were tremendous and professional to work with, which makes for the best start to a great vacation. Everything was as stated and the home was perfect for our needs. The location is spectacular, close to the River, close to town, close to everything on both sides of the river and we were able to walk everywhere. Im a 5-Star Referral for this River Gem! My dog and I had a wonderful visit to Bend, and this house was perfectly located to walk everywhere. The house was cozy, clean, and well stocked. The house was exactly as described. We loved staying here. The house has all amenities, including a fantastic bed and pillows. Our dogs loved the fenced back yard. The location was walking distance to everything. I highly recommend staying here, as well as working with Bluebird Day. Theyre fantastic! We loved our stay here! It was so cute and perfect for us! It was located in a great spot...near the river and easy walking to downtown. I would definitely come back to this rental! The property rental company was EXCELLENT about keeping in touch with us before and during our stay. It was clean and nicely decorated. Thanks for making our stay so enjoyable! The host made us feel very welcom. The home was very quaint. Everything was as listed. Location was perfect!! Right on the river, super close walk to town, Old Mill District shopping, breweries and restaurants. We will be back. We enjoyed the centrally located cottage for our family of four & 1 dog. The amenities in the cottage were nice, including tubes for floating the river and bikes-if you needed them. It was great to be able to walk to Drake Park, local breweries (10Barrell & Crux), shopping/dining in Old Mill District and jumping on running trails along the river. The host was great at communicating how to check-in and making sure everything was being provided. The location is OUTSTANDING! You can walk to everything--downtown Bend, the river, the shopping center, and a multitude of restaurants. The location is very quiet. The backyard was great. Bluebird Day is a fantastic host, they provided an effort free check-in, check-out process. The house is great, it had everything we needed. It is close to so many things, the river, parks, brew pubs, etc. Park your car and leave it, you can walk everywhere. We will be coming back! The River Gem Bungalow was a perfect spot for a quick trip to Bend with my daughter and her friend during their spring break. The proximity to the main shopping area, as well as the main park in Bend was great. There was plenty of room for the 3 of us to have separate beds (main bedroom, loft, couch), and everything we needed was in place. We cooked dinner a couple nights, including using the outdoor BBQ and found all the kitchen items we needed. We even used the Bikes, but found walking to/from the parks in the warm April sun to be our primary mode of transportation. This place was perfect. Great location, great communication, and great price. Couldnt ask for anything more. This little gem is in the perfect location. We were able to walk to the Old Mill District, 10 barrell brewery and Downtown. Walk down to the river and watch the surfers or kayakers practicing, it is quite intriguing. Although close to everything it is still a quiet neighborhood. The back yard was perfect for our Charlie dog to play and the inside is nicely decorated and cozy! Although the weather didnt allow us to bike, we did get to play in snow in our back yard. Thank you for an amazing weekend away! We had a wonderful stay! We really appreciated how available and helpful Bluebird Day was. The bungalow was lovely: clean, bright, with a great backyard, within walking distance to downtown, close to the river and parks, had everything you could want... itd be easy to stay a while. One highlight of our trip was using the bicycles (with locks and helmets!) that come with the bungalow to go listen to live, free, music in Mirror Pond Park. Its evident how the details had really been considered with this place. We hope to come back again. We loved the little bungalow. Just steps to the river trail for our morning walk and easy distance to downtown and the Old Mill District. We go to Bend every couple of months to visit family and will be renting this house again. We couldnt have been HAPPIER with our stay!! We walked to the Deschutes Brewery tasting room, 10 Barrel Pub, and the kiddos favorite was the "pirate ship park" across the bridge! The bungalow was the perfect size for our small family, and had everything we needed to have a stress free weekend vacation. Traveling is usually stressful with a two year old boy, but even he loved it. Thanks for making our first visit to Bend such a great experience...I would recommend this spot for ANYONE looking for a pad to land while you explore all the fun stuff bend has to offer. We will def be coming back...THANK YOU!! My partner and I (plus our pup) stayed for 4 relaxing nights and the River Gem Bungalow was PERFECT. Exceptionally clean with all the amenities we needed. The bed was amazingly comfortable and we slept great the whole trip. We used the bikes a couple evenings to go to town - what a fabulous thing to offer renters! We were close to the park for walks with the dog which was great. The neighborhood is lovely and the people are friendly. We were in need of a vacation and this place hit the spot perfectly. Thank you!!! This is such a cool and unique place to stay in bend. It is just steps from the river -- lots of opportunity to paddle board, kayak, etc. Downtown, old mill district are walking distance! It is nice and cozy.. Great place to spend with family. I cant wait to go back to Bend and stay with bluebird day rentals! Thank you for the awesome vacation rental. We fell in love with Bend and will definately be coming back. The location of the River Gem Bungalow is great for beer lovers like us, as there are about six breweries within walking distance. The bungalow is next to a park and a second park is easily accessable by crossing the river. The neighborhood is lovely and easy to walk around. Not only is beer easily reachable by walking so is great food and downtown shopping.